Our sports bags are available in many sizes and models. 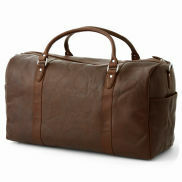 We offer a selection ranging from large weekenders and duffel bags to small gym and travel bags. Whether it's an overnight holiday or a holdall for your gym gear, the right bag keeps you organized. The gym bag goes by many names and covers a range of weekenders and duffels designed for an exact purpose. Are you looking for a gym bag big enough to hold your sports gear and fit the fitness locker at the studio or a weekender to hold everything for an overnight trip and yet still fit in the overhead bin on the flight? Finding the right bag boils down to identifying its purpose. You don’t need your bag adding extra weight when you’re commuting home after a killer workout. Choose one that is lightweight with a detachable, padded shoulder strap. Finding a bag on the smaller end can be used as a gym bag or even an ‘everything holdall’ – the gym-work hybrid. If you’re using one duffel bag for the office and sports, choose one that holds everything without mixing your sneakers and your laptop. For many guys, upgrading from your everyday backpack to a designated weekender is a big step. Its rectangular shape is ideal for toiletries and a few outfits and is great when your actual luggage is too large. Remember to choose a duffel bag that meets the carry-on luggage requirements of the airline. Want to use it as a gym bag too? Make sure it’s compact enough to fit the gym locker. You have options with materials. Leather looks like you’re going or coming from somewhere great and won’t kill your vibe when you take it with you to the office. A gym or overnight bag in genuine leather is an investment… so save and gift yourself with quality, supple leather. If you do, you’ll end up with a bag that you’re still using 10 years later. The same goes for the gym or sports bag you choose. Heading to the gym with a bag that you’re proud of will be one less excuse to not work out. Keep your bag dry and avoid storing in direct sunlight. If the leather gets dry or dull, use a leather grease with beeswax or other natural ingredients. Always let it air out after a trip to the gym or a long weekend holiday. Canvas is a woven textile fabric made primarily of cotton and should be treated the same way as other textile materials. Avoid using chemicals or detergents. Stick to warm water if possible. For tough stains, use a mild detergent mixed with warm water to gently brush the stain away. As with leather bags, let it air out after cramming it with your sweaty gym gear.